Founding priest Tengan (1273-1335) joined the school of Priest Sogen Mugaku (1226-1286), the founding priest of Engakuji, at the age of 13. He went to China in 1320 to learn more about Zen and stayed there for nine years. 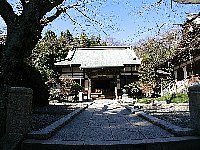 After returning to Kamakura in 1329, he was enrolled in Jomyoji, another Zen temple. When Ietoki Ashikaga resolved to erect the Temple, Priest Tengan was named the founding priest. Hokokuji reminds us of the bloody struggles erupted among the Shogun, governors and vice-governors in the early Muromachi Period. With the collapse of the Hojo regime in 1333, Takauji Ashikaga established the Muromachi Shogunate placing the government office in Muromachi district in Kyoto. (Hence the name of the Muromachi Period). As Kamakura was still an important stronghold in eastern Japan, Takauji appointed his second son Motouji Ashikaga (1340-1358) to be the first governor of Kamakura to control the Kanto (Tokyo and its neighboring prefectures) region. Motouji nominated Noriaki Uesugi (1306-1368) for vice-governor, whose ancestor came to Kamakura from Kyoto together with the Sixth Shogun Munetaka. Thereafter, the two chairs were held by successive members of the two families, during which period, however, both were almost always at odds with each other. It was in the early 15th century that a Hokokuji-related tragedy broke out. Mochiuji Ashikaga (1398-1439) assumed the fourth governorship at the age of 13 upon death of his father. As Mochiuji did not follow suggestions made by the vice-governor Ujinori Uesugi (?-1417) at all, both turned hostile to each other to the extent that Ujinori was forced to step down. Mochiuji named Norimoto Uesugi (1392-1418) as a new vice-governor. Though Ujinori and Norimoto were from the same faction, they had not been getting along well with each other, and therefore, Ujinori harbored further hostility toward Mochiuji. In capital Kyoto, Yoshitsugu Ashikaga (1394-1418), younger brother of Fourth Shogun Yoshimochi Ashikaga (1358-1408), was secretly trying to overthrow the Shogunate in an attempt to take over the seat of the Shogun himself. He sent a message to Mitsutaka Uesugi, uncle of Mochiuji, and Ujinori in Kamakura urging them to carry out a coup d'etat in Kamakura. Chances were for Mitsutaka to become the governor in replacement of Mochiuji. Both agreed to the Yoshitsugu's secret proposal and they made a surprise attack one night on Mochiuji's residence. Mochiuji was barely able to escape the attack and asked Shogun Yoshitsugu for help. Overthrowing attempt was by no means acceptable to Yoshimochi. He immediately sent his army to Kamakura to kill Mitsutaka and Ujinori. Both were caught in the end and forced to commit harakiri. A 50.7 centimeters tall statue of Shaka Nyorai is enshrined as the main object of worship. It was fashioned in the mid-14th century and reflects the Sung style carvings in China. The statue of Sho Kan'non, or Arya-avalokitesvara in Skt., ranks tenth of the Kamakura Thirty-Three Kan'non Pilgrimage. The original statue is, however, preserved at the Kamakura Museum. Also installed is a sedentary statue of founding priest Eko Tengan carved in 1347, whose posthumous Buddhist title is Butsujo-Zenji. Near the bell, a cluster of small gorinto (five-tier tombs) are standing with a large one in the center. At the time of the Hojo regime's collapse in 1333, there was a fierce battle in Kamakura, and thousands of warriors were killed. Some of their remains were brought to the Temple and buried here. The gorinto are their tombs. Entrance is located on the left-side of the main hall. In the back yard are a cool bamboo (Phyllstachys pubescens) forest and a beautifully arranged garden often seen at Zen temples. Right here the founding priest built a hermitage called 'Kyuko-an'. Stone statues of the Lord Buddha and stone lanterns are found here and there. At the south corner, there is a tea-house, where Japanese powdered tea is served. At the west end of the yard are large yagura (caves) and ashes of Ashikaga family including those of Ietoki and Yoshihisa are reportedly buried. The Temple has since served the family to console the souls of the departed, many of them died in tragedy.